ISLAMABAD — The postmortem of a Pakistani woman killed for marrying the man she loved has established that she was five months pregnant, her stepson told Reuters on Wednesday. 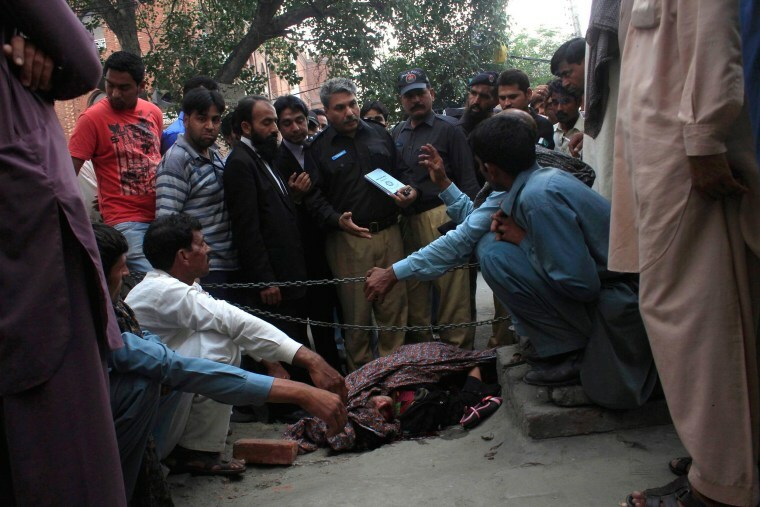 Farzana Iqbal, 25, was stoned to death by her family outside one of Pakistan's top courts in the city of Lahore on Tuesday in a so-called "honor" killing. "Her baby died in her womb," said Muhammad Aurangzeb, a son of her previous husband. Honor killings are common in Pakistan, where women are often denied their basic rights. But the brutality of this case caused outrage around the world. Many Pakistani families think it dishonorable for a woman to fall in love and choose her own husband. Police said her father, two brothers and a former fiance were among the attackers. She suffered severe head injuries when they surrounded her and threw bricks at her, and was pronounced dead in hospital. Although she was pregnant, police only registered the case as one of a single murder, Aurangzeb said. Police were not available for comment. All the suspects except her father escaped. Iqbal had been engaged to her cousin but married another man, police said. Her family had registered a kidnapping case against him and she had come to court to argue that she had married of her own free will. She was buried in her village near the city of Faisalabad.